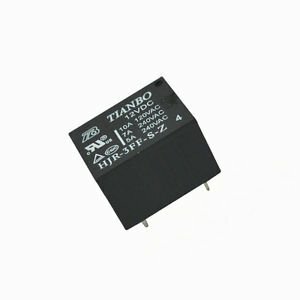 1pcs HJR-3FF-S-Z 12VDC Genuine NEW TIANBO DIP-5 Relay NEW Package includes: 1pcs HJR-3FF-S-Z 12VDC Genuine NEW TIANBO DIP-5 Relay NEW Payment PaymentPayable ToNotePayPalAll payments are due within 7 days of the close of product. Failing to do so, non-paying buyders will be reported to eCRATER.Shipping Policy Delivery TimeWe ship to worldwide, it usually takes 10-30 Business Days to delivery.Shipping addressWe ship to your PayPal address. Please, make sure to provide us with correct, precise, and detailed shipping Address.Send TimeItems will be shipped within 1 to 3 business days upon payment received or cleared.NoteIf you don't receive items over 30 business days, please notify us via eCRATER message.Return Policy We appreciate your business and offer an instant 7 days return policy. (7 days after receive the item). The returned item has to be in its original condition. We are able to refund your money without shipping cost. Contact us For anything about product, price, shipping or order status, please contact us via eCRATER message.We love positive feedback and 5 scores DSR. We will leave it for everyone that leaves it for us.